MOSCOW, November 28. /TASS/. Russian President Vladimir Putin will hold talks with his Kyrgyz counterpart Sooronbay Jeenbekov, who will pay an official visit to Russia, in Moscow on November 29, Russian Presidential Spokesman Dmitry Peskov told reporters on Tuesday. He noted that this is Jeenbekov’s first foreign visit after he assumed office on November 24, 2017. 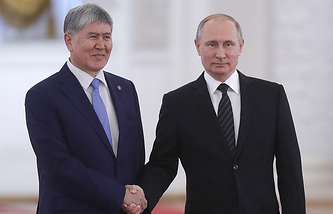 According to the Kremlin press service, "it is planned to discuss the current state and prospects for the further development of the Russian-Kyrgyz cooperation in the political, trade, economic, military-technical, cultural and humanitarian areas and exchange views on cooperation within the framework of the integration processes in the Eurasian space."